The Edouard Brun 1er Cru also accompanied the second course which was a wild mushroom risotto with a goat’s cheese croquette. 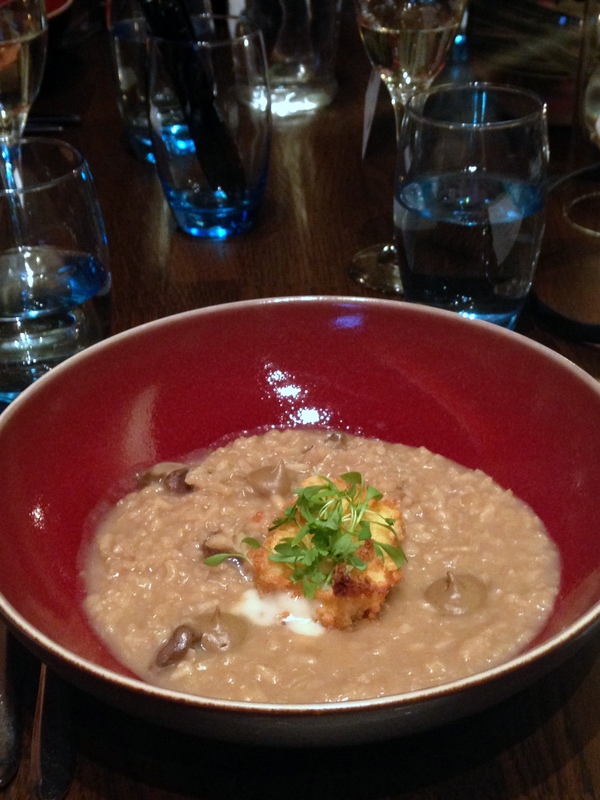 There was a good mushroom flavour in the risotto although the rice was a little overdone. The goat’s cheese croquette worked well with the rice, especially with its crunchy coating. The Edouard Brun 1er Cru was a nice match for the risotto. 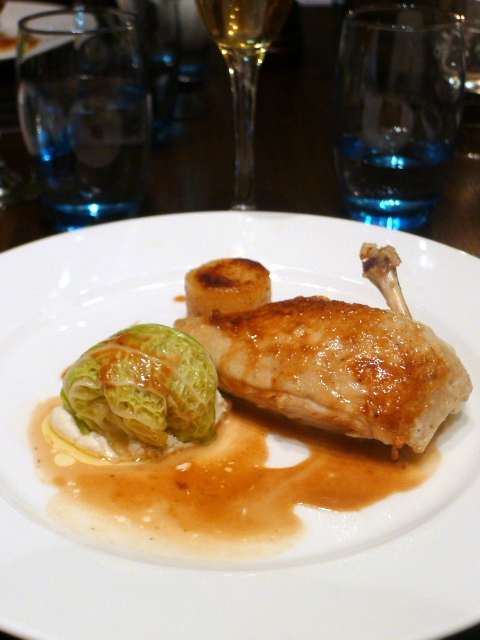 The main was a pan-fried breast of chicken accompanied with fondant potatoes, braised cabbage and a garlic cream sauce. This was a simple but pleasant dish accompanied by a drop of Edouard Brun Vintage 2002. This vintage cuvee is made from the best harvests (50% Pinot Noir and 50% Chardonnay) and is aged in deep cool cellars for approximately 5 years to allow the aromas of pure honey and oriental spices to fully mature. The Edouard Brun Vintage 2002 was delicious and lively on the palate. 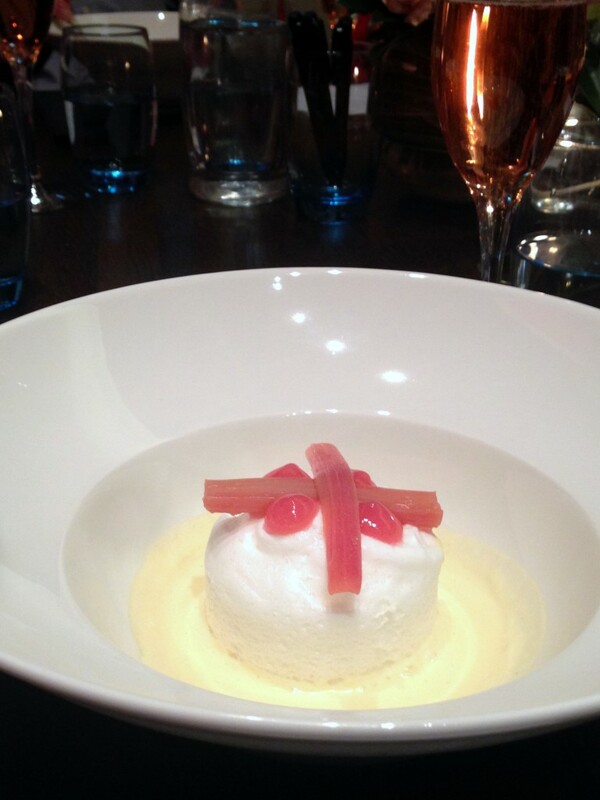 The dessert was a tasty floating island with a lovely soft meringue served with a zingy Yorkshire rhubarb and sweet custard. The champagne was the Edouard Brun Rosé. Fresh and fruity on the nose, it offered a vibrant acidity that matched wonderfully with the dessert. We had a lovely evening, sharing the champagne dinner with other guests who had bought tickets to this private event. The event was really fun and we enjoyed the food at Rotunda. 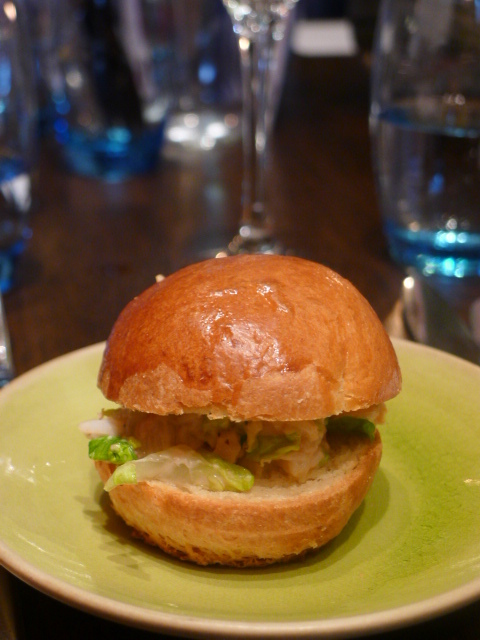 The food was simple, but tasty and conventionally appealing. But the true highlight of the evening was the delicious range of Edouard Brun champagnes that we tried, all of which were wonderful. The price tag for the event was £49.50, which was very reasonable given the quantity of champagne that we were privy too. As a destination, Rotunda makes for a great casual drinking and dining venue, and no doubt it will come alive in the summer. Prices: This champagne menu was £49.50 per head. Refer to the website for a la carte prices.